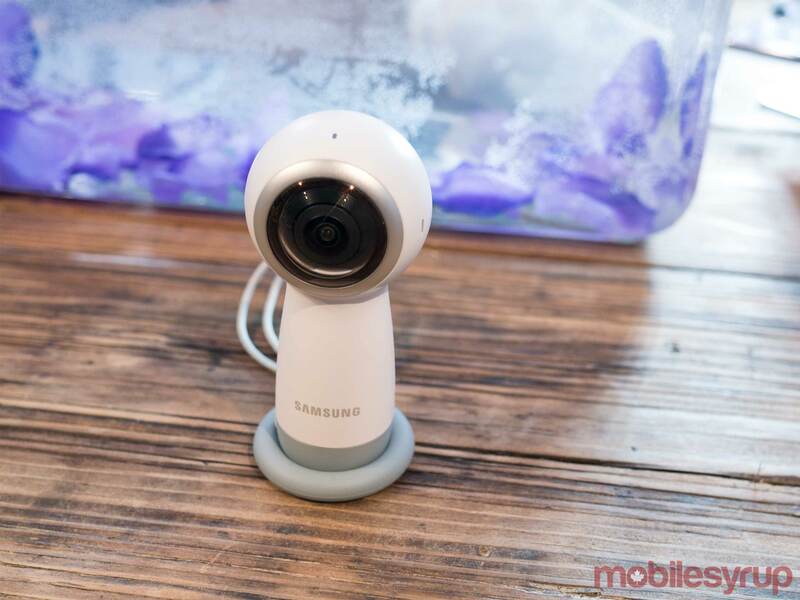 Echoing the same move made last year, Samsung has unveiled a new Gear 360 camera alongside the new Galaxy S8 and S8+. The biggest changes are the radically different form factor and 4K video recording. 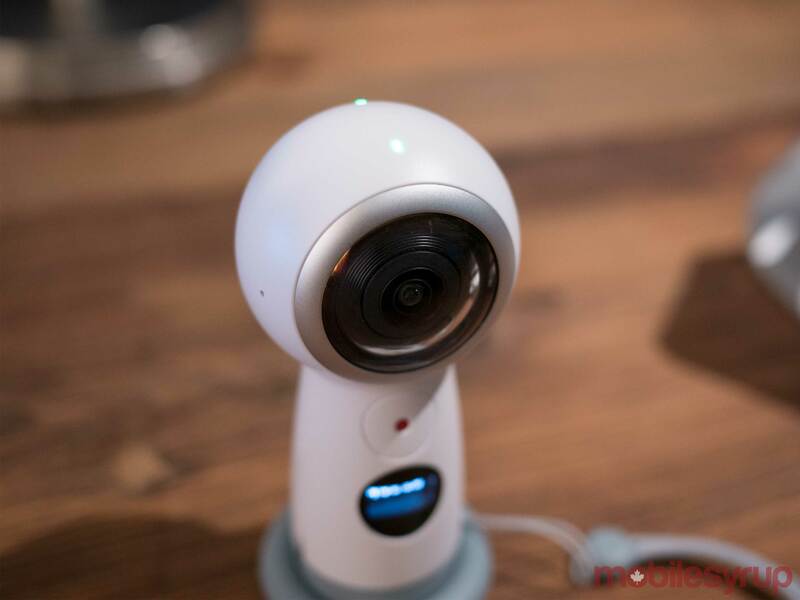 Samsung trimmed a fair bit of fat to get to this design, fusing together the spherical top with the two lenses and the base below it into one piece. Unlike the previous model, there is no detachable tripod, though the standard screw mount is at the bottom to attach it to tripods and selfie sticks. There are dual 8.4-megapixel image sensors with fisheye lenses sporting f/2.2 apertures. Combined, they can shoot at 4096 x 2048 pixels resolution in 24fps for MP4 video files (H.265) and 15-megapixels jpegs (when stills are stitched together). The small LED and record button has been moved to the base, along with the microSD card slot and USB-C charger. The latter two are different in that memory expansion now doubles up to 256GB and USB-C replaces the microUSB port used last year. The back and menu buttons are the same, as is the menu layout when making adjustments. I couldn’t help but feel like I was holding a 360 variant of the HTC Re once I got my hands on one. The short stem and one-button control within reach of the thumb is what makes it feel so similar, but this is ultimately a very different camera. With the previous Gear 360, the included tripod doubled as a handle, except the unit’s girth made it far from pocketable. This new design solves that problem. Slipping this in a pocket was easy, though I would prefer to do it with its protective pouch covering it. While smaller, the two lenses are still susceptible to damage or scratches from careless storage. 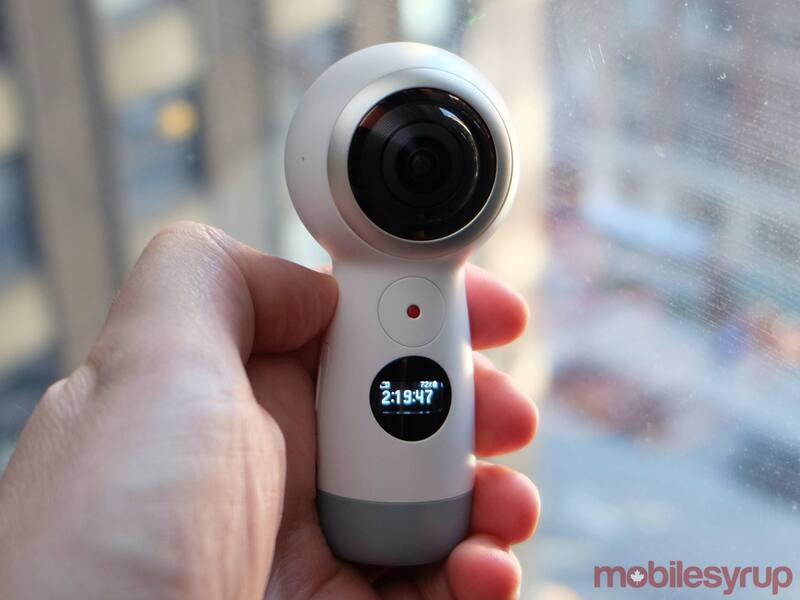 The fact this iteration of the Gear 360 is IP53-certified is a little surprising. Like its predecessor, it can withstand modest amounts of dust and minor water splashes, but is far from being waterproof, or even water-resistant. Submerging this thing is a non-starter, so underwater 360-degree video will have to wait. Had Samsung been able to make it water-resistant, at the very least, it would have been a huge boon for this camera. I haven’t felt a considerable difference in weight, which isn’t necessarily a bad thing. 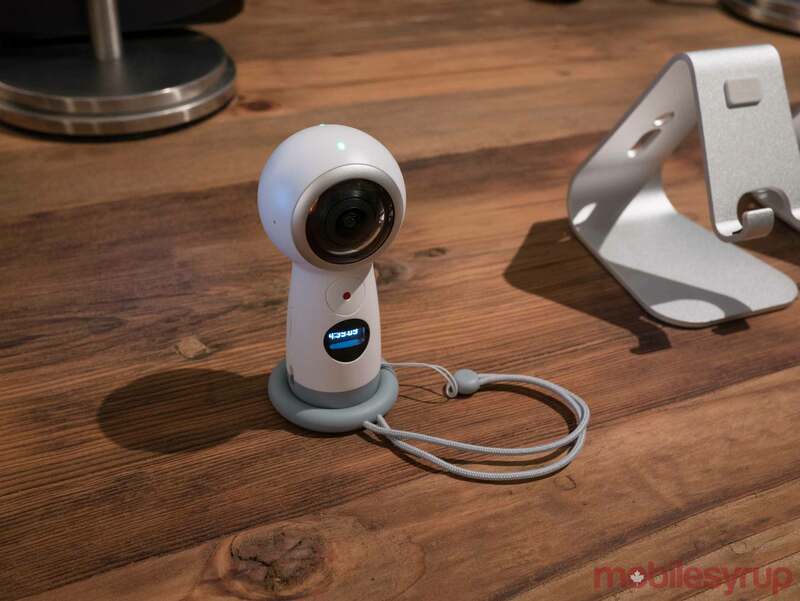 The new Gear 360 is more than light enough to carry in just about any situation. Interestingly, the lanyard is attached to a rubberized ring meant to stabilize the unit when standing upright on its own. Compatibility is what you might expect. Samsung devices that will work with the camera include the Galaxy S8, S8+, S7, S7 edge, S6 edge+, S6, S6 edge, Note 5, A5 and A7. That a couple of mid-range handsets are part of that group is interesting. Beyond that is iOS compatibility with the iPhone 7, 7 Plus, 6s, 6s Plus and iPhone SE. The same software from the previous model will also work on Windows and MacOS. 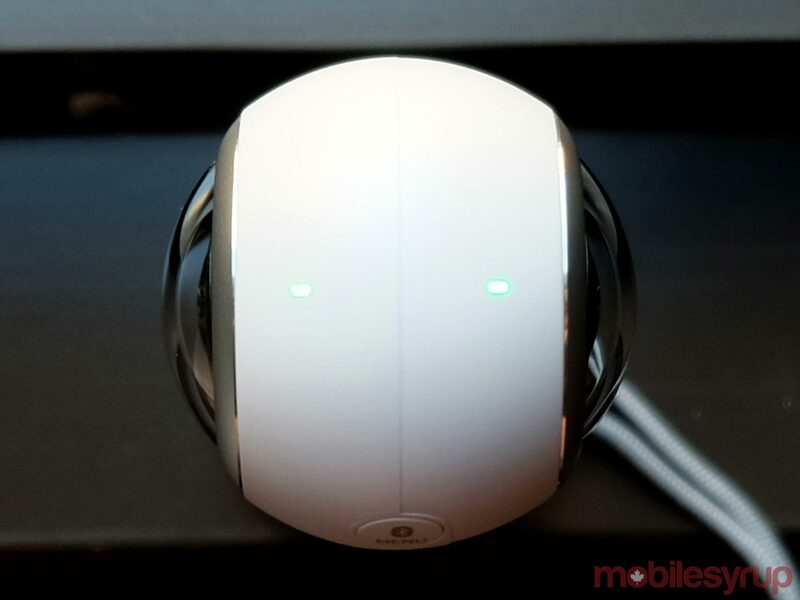 The Gear 360 app remains the primary conduit to getting recorded content over to a phone and then on to social media or wherever else. Samsung played up the live streaming features, which appear to be interesting. 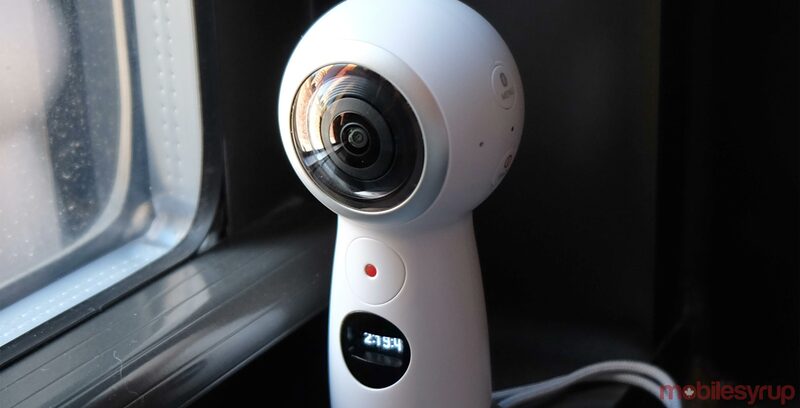 The two caveats are that live streams max out at 2K resolution, and it’s not clear how much bandwidth would be required to live stream a minute or two of 360-degree video. The iPhone support comes off as a big concession for a company that might have otherwise resisted such a move. Doing it makes sense in a variety of ways. Samsung had excluded other Android devices when it launched the first camera last year, and has wisely chosen to expand compatibility to those too. You just need to be running version 5.0 Lollipop or newer. It’s too soon to fully vet image quality because it’s not immediately clear how much, if anything, has changed in composition. 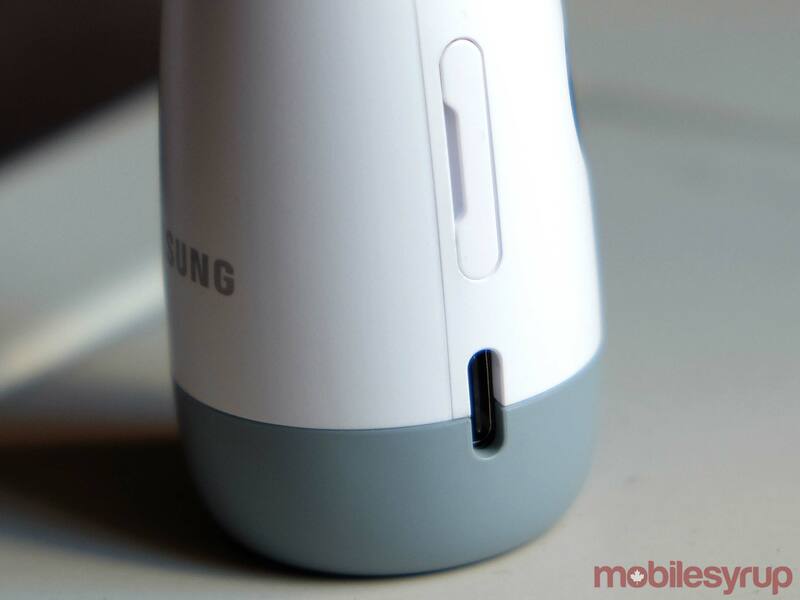 Even so, it’s fair to say Samsung will have given it a shot. As a betting man, I would say this year will be an improvement. Low-light shooting was difficult at the best of times with last year’s model, and a tighter aperture this time around might have been one trade-off to trimming the fat. The cursory shooting thus far is really only a sample. It will be interesting to see how this model performs in more active scenarios. One thing that may play a bigger role is the simple fact the two lenses are closer together, putting less of an onus on the software’s stitching process to seamlessly blend them. Again, only further testing can prove how much of a difference that would make. Samsung Canada hasn’t confirmed pricing or availability yet, nor if the camera might be sold as a bundle. Retailers might have the option to do that, so time will tell. The price may also be lower than the $499.99 the current model sells for.